Discussion in 'General Discussion' started by GodzillaGTR, Sep 2, 2017. @DaVeX It's still basically a traditional single screen 2D experience. As FeltHat says it is head tracked within the environment but the screen is still just a screen like it would be with a monitor or tv. I find the tracking handy as I can mirror my second screen with TS and forums etc off to the side but how useful that might be for you I'm not sure. I had hoped there would be some method to snap two screens inside it so I could set up surround across the two desktop monitors and mirror the whole thing but there's no snapping. I'm still tempted to give it a go but thing it might be a bit awkward to get them aligned and sized equally. I just sold my Rift ,lol and got a 40"4k monitor butted up against my wheel ! I will revisit VR when PCs can run em and resolution is 4k at least ! Hope you got your next appointment at specsavers booked up lol ! Yes I have put the VR away for now also so I can enjoy AMS! Purchased a Samsung 43 inch ultra widescreen and mounted it (upside down) between steering wheel and wheel base. Absolutely fantastic. I really never new how nice AMS looks. Just finished my 1st real race with it, best sim race I've had in years. What exact model monitor did you get? Sounds nice! Wow--very nice!!!!!! And the all-important 120 Hz refresh rate that so many of the ultrawides are missing--even the expensive ones. I have a 35" 144 Hz 21:9 monitor that has made me realize I would never want triples or a regular monitor again! 32:10 is even better!!! Why may i ask would i need an Optometrist ? We don't care about game pics or sorta, we know it is still wip but at least let the hype train start, tell us something!!! 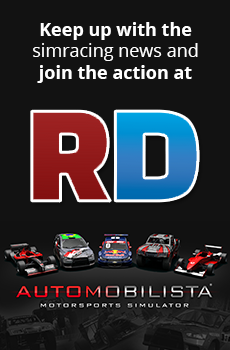 And I add another request: Any news regarding the last DLC for AUTOMOBILISTA? Thanks and regards. Surprised no has mentioned the Studio 397 interview on Davey Jones channel. Although Reiza have discussed licensing the rF2 engine with them, they haven't done so (so far). Anything illuminating in this (sorry, not willing to invest 1 hour 15 without a good review )? Or at least i hope that they will be a bit "quicker" (only a bit) in the development process compared with the time that is using S397 with rf2.